If your best friend in the world, your lover, your life-long mate, has been hit with the flu, you might suddenly find yourself taking care of a whimpering, demanding, annoying childlike adult. This doesn't mean the end of your marriage. While it isn't easy, you can survive your spouse's flu. Most of the time, the flu is a self-limited infection that gets better on its own. 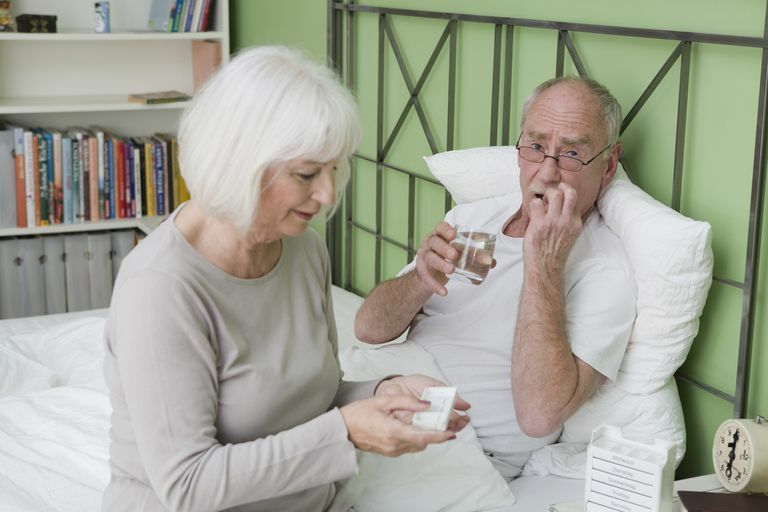 You can help keep your spouse comfortable as the infection is clearing- and rest assured that your loved one will get better soon. When your spouse is sick, it is an extra burden on you. While your spouse will likely stay home from work, you probably can't take sick leave, and you are also going to have to pick up the slack of taking care of the house, kids, car, errands etc. while your spouse is recovering. On top of all that, you are probably the only one who really knows how to make your spouse comfortable. So this can leave you feeling exhausted. And, you also need to try to prevent yourself and the rest of the household from catching the flu. This is a tall order, but there are some strategies you can use to survive your spouse's bout with the flu. Try to avoid getting the flu by getting a flu shot. It is better to do this before your spouse gets sick, but if you haven't gotten around to it yet, now is a good time. When someone in the house is sick with the flu, wash surfaces with a 10 percent bleach solution or a bacteria-fighting cleanser. Keep yourself well by washing your hands frequently. Don't give your spouse a little bell to ring. No matter how miserable he or she is with the flu, you will become needlessly exhausted and irritable if you are summoned by the sound of a bell! Treat yourself to a little luxury like a box of chocolates, a glass of wine, a good book, a hot bath or shower, a nap or a favorite movie on TV. Most adults don't like to depend on others, except for their husband or wife. Your spouse will likely feel weak, tired, miserable, achy, and alternate between hunger and lack of appetite, and will lean on you for support. You can help make this flu a little easier to bear for your spouse. As soon as you know for sure that it is the flu that has downed your spouse, put a cool cloth on his/her forehead for comfort. Keep pushing liquids at your ill, flu-ridden mate. They replenish lost body fluids, electrolytes, and minerals. Sports drinks, juices, and water are okay. Don't serve caffeinated or alcoholic drinks. Serve chicken soup. It is an easily digested liquid with lots of minerals, proteins, and carbohydrates and makes you look like a compassionate, caring person even if you don't feel that way. When your spouse is feverish with the flu, a tepid bath is soothing and helpful. Lower the heat, remove the covers and have your mate take off socks and extra clothing. Rubbing alcohol baths are ​no longer recommended. Insist that your spouse rests while ill with the flu. That means minimal TV, computer, and cell phone. Think about throwing out your spouse's toothbrush and lip balms or lipsticks if they've been around for quite awhile. A humidifier can cut down on your spouse's congestion and make it easier to breathe. Be sure to change the water and clean the humidifier daily so that it will not become contaminated with bacteria. Change bed linens often. Nice clean, fresh sheets are comforting. Plump the pillows now and then. Keep your sense of humor- this will pass, and there is no need to add hard feelings or mean words to your spouse's headaches as he or she is recovering! If your spouse is sick with the flu for more than a week or appears to be feeling worse, make an appointment with a physician. Piper K, Youk A, James AE 3rd, Kumar S. Paid sick days and stay-at-home behavior for influenza. PLoS One. 2017 Feb 2;12(2):e0170698. doi: 10.1371/journal.pone.0170698. eCollection 2017. Schwarzinger M, Carrat F, Luchini S. "If you have the flu symptoms, your asymptomatic spouse may better answer the willingness-to-pay question". Evidence from a double-bounded dichotomous choice model with heterogeneous anchoring. J Health Econ. 2009 Jul;28(4):873-84. doi: 10.1016/j.jhealeco.2009.03.002. Epub 2009 Mar 21.